Graham Turner has agreed to manage Steve Guinan’s legends team when they play the fans team at Westfields on March 22nd in aid of Children With Cancer. Turner will pit his wits against Peter Beadle who will manage the supporters team. It is hoped that there will be a good turnout of supporters for the game not only to help the charity but also to point out to the FA the support for Hereford FC. 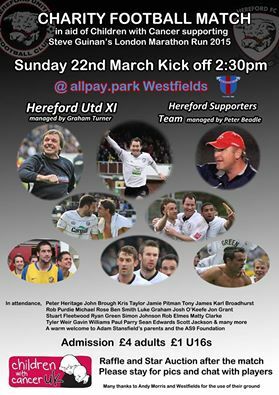 “It would be good to see as many Bulls fans as possible at Westfields for the Steve Guinan charity fundraiser on Sunday, March 22nd to demonstrate to the authorities the levels of support we can achieve next season,” said HUST vice-chairman Martin Watson. 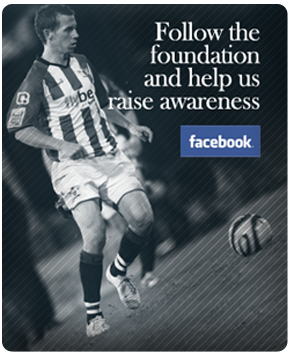 Meanwhile HUST’s membership table will be at Westfields on Sunday, March 22nd for the game. The table will have the usual merchandise available as well as membership forms and Standing Order forms for regular monthly donations as HUST builds towards the allotted 50% stake in Hereford FC. Prize Bull entry forms will also be available for £4.33/month single and £21.65/month Perm5 entries. Xpression FM Annual Charity Match. Supporters Walk To Yeovil To Raise Funds.